Diogo Dalot To Make His Premier League Debut This Weekend? Diogo Dalot returned to Carrington on Tuesday, and could feature against Crystal Palace this weekend. The Portuguese defender was one of Manchester United‘s few summer signings in 2018, as he made the move from Porto for a reported fee of £19 million. The 19-year-old was expected to give some competition to the experienced Antonio Valencia, but an injury he picked up in April has kept the United fans from watching their new signing in full action. 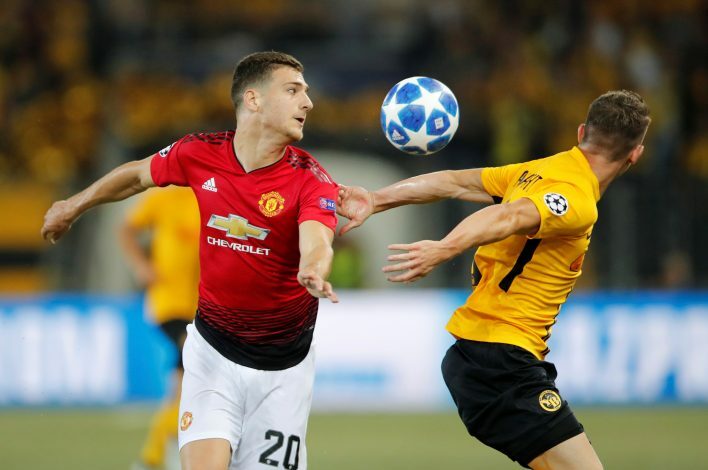 Dalot made his debut for the Red Devils in their Champions League clash against Young Boys, wherein he played for the full 90 minutes. But a relapse has seen him miss training at Carrington for the past couple of months. But now, good news awaits the Mancunians, as Dalot seems to have fully recovered from the injury. The Portuguese starlet was seen training at Carrington on Tuesday, as he prepared for the upcoming Premier League fixture against Crystal Palace. The 19-year-old could make his first league appearance for the Reds this weekend, as Luke Shaw was shown his 5th yellow card in the Manchester Derby, meaning Ashley Young would vacate the right-back spot to fill in at left-back against the Eagles. Further, Antonio Valencia has fallen further down the pecking order over the past weeks, and Dalot seems to be in pole position to take full advantage of the Ecuadorian’s woes. Manchester United have been struggling in defence this season, having already conceded 21 goals in 12 games. Jose Mourinho shall thus be hoping that Dalot successfully provides the required defensive c0ver in the coming weeks.